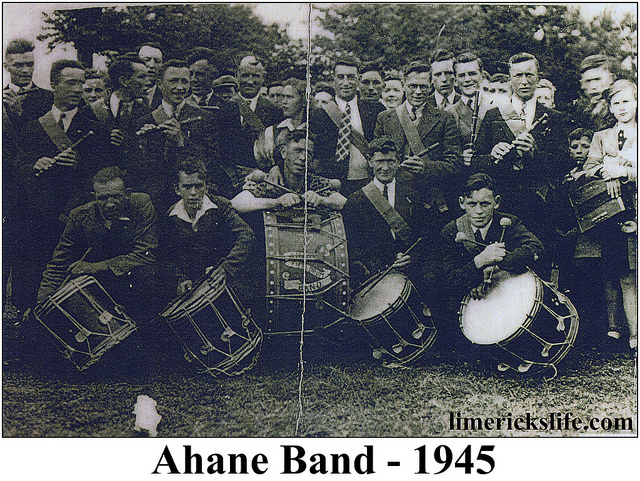 After extensive research, it has been concluded that there is no definitive answer as to when Ahane Fife and Drum Band was formed, and also that there is not a lot of recorded data regarding the band in general. Below is a summation of the known history available on Ahane Band. The first possible founding year was 1910, when the band was recorded as performing at a match between Murroe and Newport in Newport. The year 1911 was indicated on a hand written note that was attached to the first photograph. John T. Gilhooly in “The Annals of Castleconnell and Ahane since prehistoric times” recorded it as 1918. 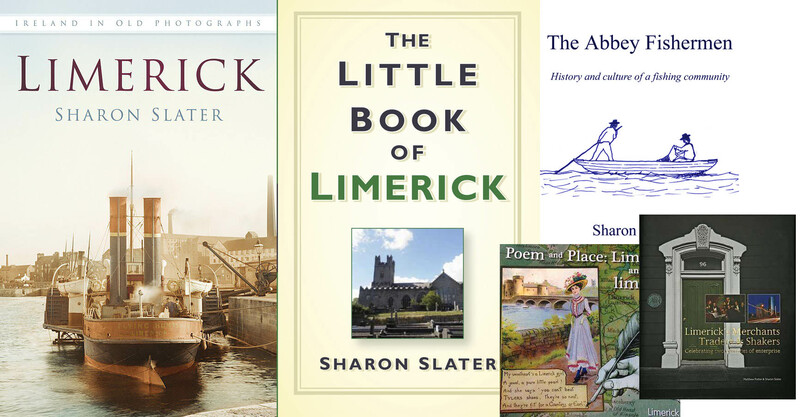 While Mary Antoinette Moloney in “The Story of Ahane” recorded it as 1924. Both Gilhooly and Moloney agree that John Vaughan was one of the driving forces behind the formation of the band. It is also agreed that the Band’s big drum was donated by Charles Barrington. 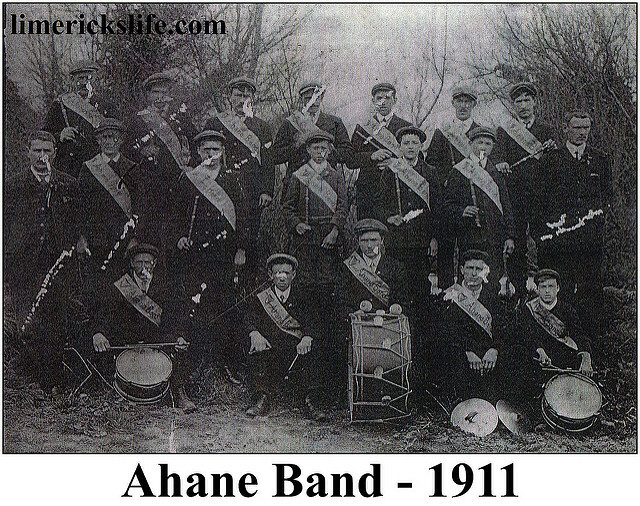 The sash worn by the band members was green, white and gold with the words Ahane Band emblazoned on it. While in later years the drummer wore a leopard print vest. The band had three incarnations, the first prior to the 1920s who practised at the home of Ned Lawlor of Killeenagarriff. The second incarnation was in the 1931 when two brothers Martin and Mattie Collins revived the band. During this period there were about 30 members of the band. Under the guidance of Paddy Salmon they practised in a cowshed on the O’Malley Farm in Killeenagarriff each Tuesday and Friday. The bands final grouping was formed in 1942 and would last until the 1960s. This band would often accompany sporting teams from the parish to matches. 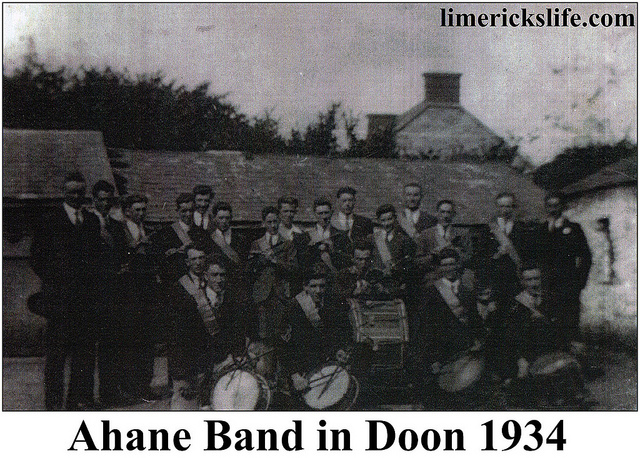 This band also played for the Three County Féis in Castleconnell in 1945. Some of the notable members of the band were Ned Lawlor, John Vaughan, Chris Richardson, Bob Richardson, Paddy Richardson, Tim Aherne. Martin Collins, Mattie Collins, Larry Fleming, Phil Fleming, Tim Moloney, John Moloney, Harry Ryan, Patrick Ryan, Ned Malley, Jack Malley, John Connors, Joe Connors, Harry Richardson, Mick Richardson, Jack Richardson, John Connell, Ned Nealon, Willie Doyle and Joe Flannery.